Who can know what passes through the mind of a person near death, especially those under the influence of mind-altering drugs? Irish playwright Marina Carr has one version, and it isn’t pretty. This proclivity for darkness should come as no surprise to those familiar with Carr’s work. Woman and Scarecrow, originally performed in 2004, is a largely grim and ominous piece, and in the Carr mold, rich with allusions to cultural myths and absolutely dripping with the influence of Greek Tragedy. Director Ciarán O’Reilly has delivered a top-drawer production, coaxing the best out of a difficult play, with a roster of remarkable actors who have plunged into their roles head-on with fierce commitment and splendid, award-worthy performances across the board. In a surreal two hours-plus run time, we bear witness to the tragic early death of Woman (Stephanie Roth Haberle), who teeters between intense rage and a gentler, though still wildly passionate, reflection of a life review. The play needs editing – it is long and repetitive – but therein is contained a heap of deep thoughts. Carr is, if nothing else, immensely literate and observant of the human condition. At the same time, much of the philosophizing in Woman and Scarecrow is banal, only elevated to soaring heights by Carr’s skill as a playwright and wordsmith. The characters are not named, underscoring the “everyman” view of life, death and the Universe. Woman is very near the end, in a ravaged body, accompanied through this journey by Scarecrow (Pamela J. Gray), perhaps an alter ego, perhaps a hallucination, perhaps a guardian angel or possibly all of the above. Scarecrow is cool, analytical – a relentless observer of Woman’s life history – and she’s not cutting her any slack for it either. Ominously lurking is Death, inhabiting the bedroom wardrobe, unseen till the end, but implied to be a terrible beast who can’t wait to devour Woman. Woman, it turns out, has lived an unfulfilled life with an unfaithful husband (Aidan Redmond), has had affairs herself, has borne eight children, lived in a place she’d rather not have wound up in, and ultimately declared that her life-long unhappiness has been self-inflicted, a willful act. Like Carr’s most well-known work, By the Bog of Cats, as well as her other plays, Carr’s dark themes are often interpreted to link to the overarching Irish persona, particularly in relation to the long-standing conflicts with British rule and in modern times, the Troubles in Northern Ireland (which had an impact on her own childhood). The clearest manifestation of nationalism in Woman and Scarecrow is embodied in Aunty Ah (Dale Soules), a pious woman, who raised Woman in the absence of her mother. Aunty Ah’s blind devotion to her Roman Catholic faith, and Woman’s rebellion of it, mirrors an exact point in history: about the time of the writing of the play, the iron fist rule of the Church in Ireland (and thus Irish patriarchy) was beginning to loosen (and in a very short time ended in a dramatic final finish). There is a redemptive slice of realization at Woman’s life’s end, that life is meant for living. Yet, the overall tone of the work is relentlessly depressing, despite stabs at dark humor and despite the sheer brilliance of its literary/artistic references and Socratic argument. “A person’s passing is a sacred thing,” Woman declares. Perhaps this is why, except for several visits by Him and Aunty Ah, she’ll have none of the family and relations, including the children, and especially the priest, who keep vigil beyond the bedroom door. Woman dies alone, taken by the beast in the closet, a giant crow, who may or may not be Scarecrow. “God is for the living,” Woman had earlier declared. This “godless death” may not be the white light of grace that many have come to believe in, but it certainly is release for Woman and an exhausted audience of witnesses. Adding superb atmospherics to Woman and Scarecrow are the technical and behind the scenes personnel. 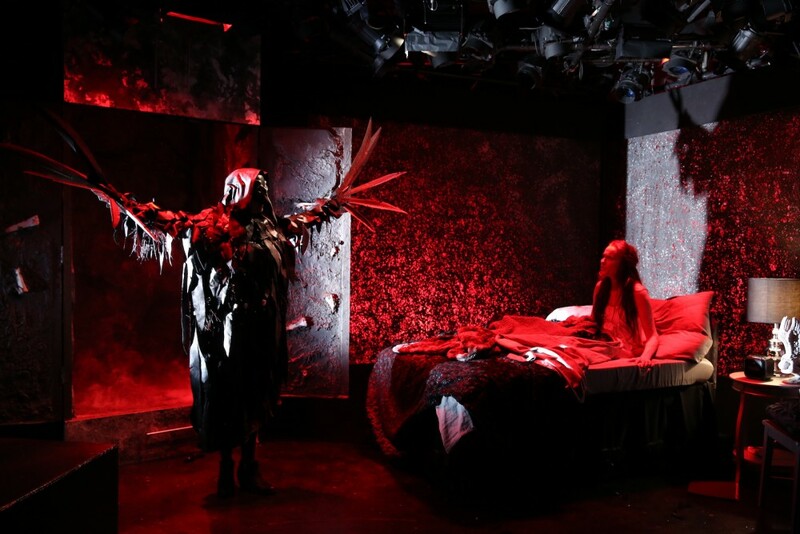 Charlie Corcoran has designed a dark, creepy and forbidding set, a claustrophobic bedroom, amply made all the more grim by the almost constant rumble of sound effects and original music by Ryan Rumery. Lighting by Michael Gottlieb bends to the volley of emotion and wordplay defining the play’s action, while costumer Whitney Locher symbolically pits the sleek black dress of Scarecrow against the white of Woman’s nightgown. The beast in the closet was executed by Bob Flanagan with a canny nod to the Crow as Angel of Death. 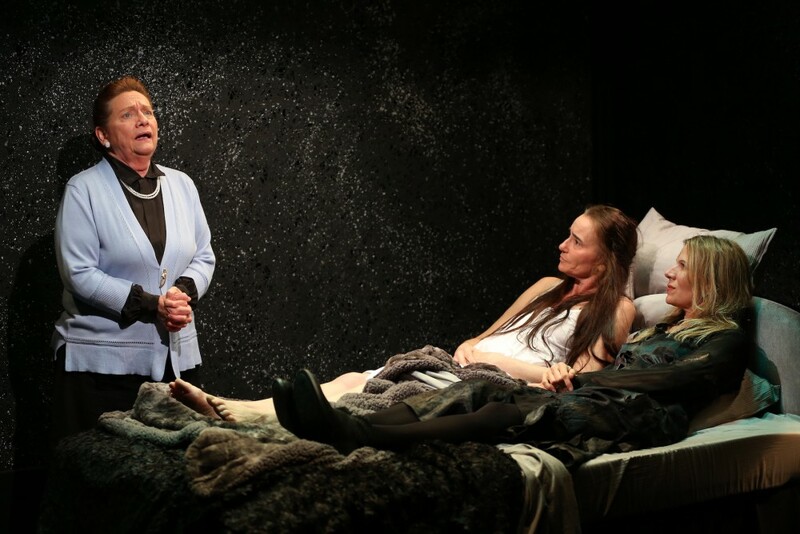 Woman and Scarecrow plays at the Irish Repertory Theatre through June 24 – Run Time 2 hrs. 10 min.